On the evening of April 10th a calf made a break from a slaughterhouse in Paterson, NJ. He eluded capture for hours and even waded into the Passaic River (yuck!). Police used vehicles to ram into the calf in an effort to bring him under control until a tranquilizer gun could be obtained. The story was picked up by local news and in the piece the slaughterhouse owner said he would release the calf to an unspecified farm. Suspicious of the kind of farm that he might end up at, uber-volunteer Mike Stura, who lives not too far away, called us early the next morning. We agreed we could help and Mike dropped everything to go get the calf. He has a truck and a recently-acquired trailer for just this purpose. 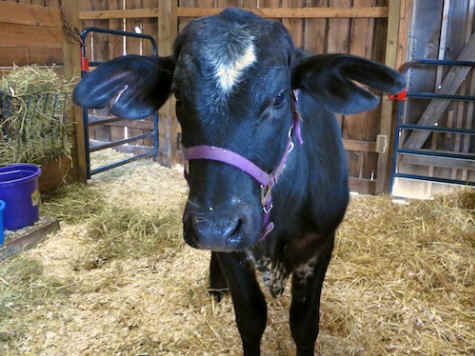 It turns out the calf had already been transported to another slaughterhouse (not the “farm” as promised on the news), but Mike pursued it and was able to convince the owner to release him. We named him “Mike Jr.” after his rescuer. Human Mike took Bovine Mike to a local vet to treat the wounds and abrasions from being the target of a demolition derby the night before. After some shots and cleaning of the wounds, the Mikes were given the “go” to head upstate to WFAS. It remains unclear if Mike Jr. will stay here forever or if we find him the perfect permanent home — this depends on how well he gets along with the other cows and other factors — but rest assured, he will never end up at the end of a fork!